Signed lower right, 'F. 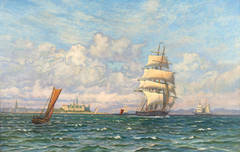 Ferraro', titled indistinctly and painted circa 1925. A panoramic Mediterranean coastal landscape showing a view of figures on a sandy beach with a cottage tucked into the lee of a hill. An elegant and painterly treatment with deft brushwork and a harmonious palette. minor restoration, edge-rubbing, minor losses; unframed. Modernist view of a city in winter. Oil on board, circa 1940. Unsigned. Displayed in a grey modernist frame. Image size, 12"L x 16"H, overall 18"L x 22"H.
Vintage modernist portrait oil painting. Oil on canvas, circa 1950. Unsigned. Displayed in a period modernist frame. 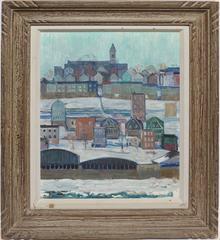 Image, 18"L x 24"H, overall 24"L x 30"H.
Modernist view of New York City. Oil on canvas, circa 1968. Displayed in a giltwood frame. Image size, 16"L x 12"H, overall 23"L x 19"H.
Modernist view of an asbtracted still life. Oil on canvas, circa 1950. Unsigned. Displayed in a brown wood modernist frame. Image size, 32"L x 18"H, overall 33"L x 19"H.
Vintage Paris modern street view. Oil on canvas, circa 1955. Signed. Displayed in a period modernist frame. 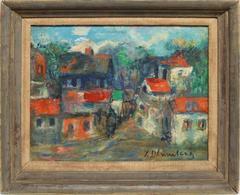 Image, 24"L x 18"H, overall 32"L x 26"H.
Modernist view of a town. Oil on canvas, circa 1935. Signed illegibly lower right. Displayed in a hand carved impressionist frame. Image size, 36"L x 30"H, overall 43"L x 37"H.